It’s no secret when you walk into our building; You are entering not only the sweetest building in the world, but it’s Pittsburgh Steeler country as well. Today a bunch of our sweet employees came dressed for the occasion. Black and Gold everywhere and Steeler fight songs playing on radios through out the building. Actually, the only thing missing football, was our chocolate footballs lol. We shipped soooo many of those chocolate sports treats to our customers for their own Super Bowl Parties, we had none left for our own employees. 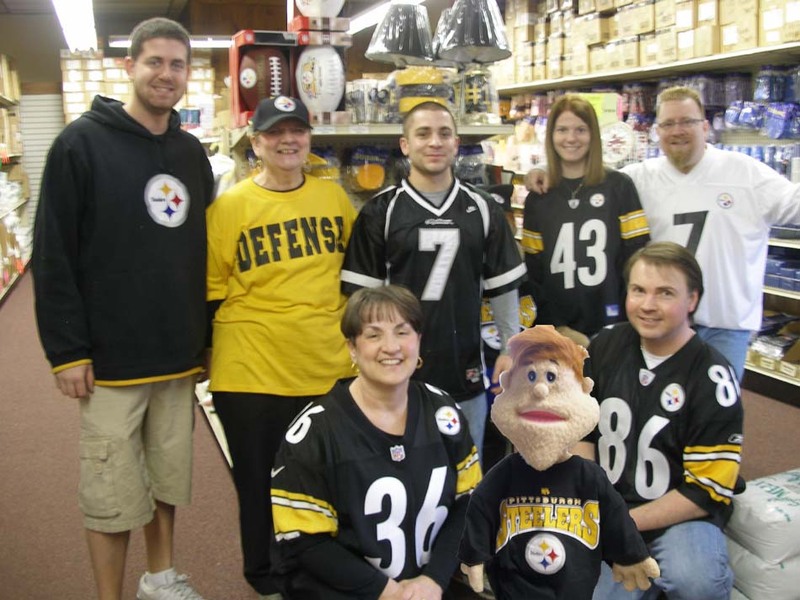 Go figure, we normally have case after case, but because there are so many Steelers fans across the USA, they came from everywhere and found our online candy store and were buying them cases at a time. How sweet of the manufacturer to tell us our new shipment would be here 2 days after the big party ugh. Some of our customers didn’t mind the wait, they didn’t really need them for the big game, but for a sports themed party and can wait till they arrive. Others, begged, pleaded and called a lot, but nothing we could do. We’ve now been telling them to cheer even louder, because when they win Super Bowl 43, there will be a lot of post Super Bowl parties going on across the USA and we will be able to send the chocolate footballs to them. Thank Goodness For The Old Fashion Cough Drops! Remember the good old fashion great tasting cheap cough drops like Smith Brothers, Ludens, Vicks and Pine Brothers? Thank goodness, all but the Pine Brothers are still made today! The new cough drops or throat lozengers of today, just don’t taste the same or as good and I don’t feel do anymore than the retro ones. I myself was a fan of the Smith Brothers cherry cough drops and still am. They still taste more like candy than they did a medicine that could stop my cough or sooth my burning throat. I’d pop 2 or 3 of the cherry flavored ones at a time, but never the black licorice ones. I’m not a big fan of black licorice anything. I could spot those two Smith Brothers on the front of that white box and still remember trying to open the waxed paper type sleeve that lined the box and be quiet so my mom or my teachers didn’t hear me digging for another. Now I’m no longer in school or living with with mom and dad, so I can rattle that package as much as I want, plus eat the whole box too! One very interesting thing about these cough drops I learned later in life. They kept the 2 brothers faces on the box so everyone would recognize the product and not try and copy them. Also, next time you see a box, take a look under both brothers picture. One states the word trade, the other say mark. Very clever way to let the public know their product is trademarked lol. My next favorite was Vicks cherry flavored cough drops and even sometimes when the coughing was out of control, I’d step it up a notch and go for the Vicks mentol. I remember their triangle shape and how my tongue would always seem to trace that triangle when they were in my mouth. These are also still available today and they are still the same recipe and packaged the same way. Ludens cough drops are also still being made and still popular especially their honey licorice cough drop flavor. The only Nostalgic cough drop gone is the Pine brothers cough drops. Now these were different. They were an odd shape and a odd texture for back then. Kind of oval and a gummi but not gummi feel. I actually liked these things, but I do remember a funny after taste. These ones were a little different, you either loved them or hated them. My favorite memories of all of these was the fact that when I was in school, candy was a no no in class, but these were not really a Wrapped Hard Candy, so all it took was a note from mom or dad, and you could eat as many as you wanted while class was going on. Do any really stop my cough, well for me they do, but so will and hard candy you have swirling around you mouth creating saliva. Some doctors will disagree and tell you they don’t really stop the cough, they just help us put up with it. I’ll use my own judgement and keep popping these great tasting cough drops. Sure beats the flavor of the new ones out there today, Yuk!